Munsey graduated in 1966 from Boston University with a bachelor's in music, after which time he came to the Upper Valley to teach in the Lebanon School System. After teaching locally for three years, Munsey was “invited” to join the US Army and spent the next two years in military service. After a year in West Hartford, Connecticut where he studied at the Hartt College of Music, Munsey returned to the local school scene. 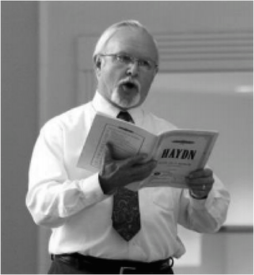 Throughout his career in teaching he has had the opportunity to work with all manner of vocal and choral groups, including a one-year stint as guest conductor for the Dartmouth College Glee Club. He has also sung with a number of choral groups and in many Upper Valley musical productions. "It is a real pleasure to assist Jane and to sing with the talented members of Bel Canto Chamber Singers," Munsey stated.